I remember at a Republican Convention in Miami (1968 I think) when one of the networks had the late Frank Reynolds sitting with Galbraith and William F. Buckley, Jr., to provide occasional commentary on the scene. On this occasion, Galbraith was going on and on about how all of the Republicans had arrived at the convention in their yachts. Buckley sat by, nodding, in uncharacteristic silence. Finally, with a few seconds until they needed to break away, Buckley slowly and deliberately drawled at Galbraith something like the following: ‘And John, when you visit your friends in Hyannis Port, I trust that you find the accommodations adequate?’ As they cut to commercial, you could hear Reynolds, and others in the background, convulsed in laughter. David Levy and I once wrote a paper in which we measured the writing quality of articles by many important economists. When we presented the paper to the meetings of the American Economic Association, Galbraith was the discussant of our paper. For his comments, he basically recycled an old paper he had written on writing economics, and showed no signs of having read our paper. But he did seem to enjoy our mentioning that by our measures, he turned out to be one of the best writers in the profession. My memory is that at one point, just before or just after the formal proceedings, he actually patted me on the back. Galbraith wrote many books. One that I enjoyed, and learned from, was his account of the stock market crash of 1929. Harold Demsetz tested this hypothesis by comparing the rate of profit of firms in and out of the technostructure, reasoning that if technostructure firms were not maximizing profits, we would expect their profits to be lower than those of other firms. He found that there was no difference between the rate of profits of the so-called ‘technostructure’ firms, and the non-technostructure firms. Demsetz’s conclusion was that there was no distinguishable technostructure, and no new industrial state. I tell my classes that if we don’t throw entrepreneurs such as Michael Milken in prison, they can provide us with the means to keep CEOs pursuing shareholder value (profits) as their goal. The way it would work would be that if CEOs start pursuing something else, their firm’s stock price falls, and the firm becomes an attractive take-over target for someone like Milken. I also point out that if firms maximize profits, a lot of rich people benefit, but that a lot of average people benefit too—Drucker emphasized that roughly half of the value of stock equity in the United States is held by worker pension funds. I did not agree with Galbraith’s efforts to grow the government, but he was witty, and urbane, and intelligent. The intellectual scene was more interesting, and fun, with him than without him. He will be missed. Demsetz, Harold. "Where Is the New Industrial State?" Economic Inquiry 12, no. 1 (1974): 1-12. Diamond, Arthur M., Jr., and David M. Levy. "The Metrics of Style: Adam Smith Teaches Efficient Rhetoric." Economic Inquiry 32, no. 1 (1994): 138-45. Drucker, Peter Ferdinand. The Unseen Revolution: How Pension Fund Socialism Came to America. 1st ed: Harpercollins, 1976. Galbraith, John Kenneth. The Great Crash 1929. Houghton Mifflin Co., 1961. 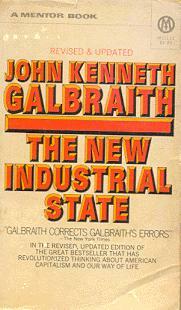 Galbraith, John Kenneth. The New Industrial State. Houghton Mifflin, 1967. Kornbluth, Jesse. Highly Confident: The Crime and Punishment of Michael Milken. William Morrow & Co., 1992. I don’t have time to read Galbraith’s account of the crash, could you possible summarize in a sentence or two? Thx. Another account of the man from Peter Boettke. Would you rather be known as politically influential, famous among the intellectual elite, or making a lasting scientific contribution? This is a variant of the question James Buchanan would often ask a graduate student. The “correct” answer was of course to make a lasting scientific contribution — to be read not in your lifetime, but centuries after your death. Among economists perhaps nobody exemplified the opposite of this in the 20th century more so than John Kenneth Galbraith, who passed away on Saturday. The NYT obituary does an excellent job conveying Galbraith’s influence on our political and intellectual culture. The claim is made that Galbraith is the most widely read economist in the history of the discipline. Richard Parker’s biography, John Kenneth Galbraith: His Life, His Politics, His Economics is also an excellent source for studying the impact of Galbraith had on the intellectual and policy debate. But Galbraith’s claim to scientific influence is dubious at best. Parker tries to make the case that Galbraith’s ideas are now influencing modern economic discussions in the scientific literature like behavioral economics. Among heterodox economists Galbraith is no doubt an icon, but as someone who made a lasting contribution to the mainline of the discipline it is hard to agree with Parker. Galbraith achieved influence and fame, but did not make a lasting contribution to the advance of the discipline of economics. He did set a standard for writing that we should aspire to achieve, but his core ideas are either restated Veblen, warmed over Keynes, or Marxist platitudes. It is not clear that any of his ideas are original enough to warrant that he be placed in that company of critics of the market economy. But there can be little doubt that between 1950-1970, he perhaps more than anyone popularized the teachings of Marx, Veblen and Keynes and made them acceptable to generations of Harvard students and members of the intelligentsia in the English speaking world. On a personal note, I met Galbraith and shared dinner with him one night in the early 1990s. I was prepared to hate the evening only to be completely charmed by the man and his stories of JFK and India, of battles with Milton Friedman and William F. Buckley, or a profession which has succumbed to too much formalism, disrespect for history, and an inability to address the institutional contingencies of our age. It was an amazing evening and it was one of the important moments which taught me that you cannot divide the world neatly into those who are stupid, those who are evil, and those who agree with me. Instead the world is full of charming, brilliant, and good hearted individuals who just happen to hold opinions opposite of the ones I do. Understanding results from delving into those reasons for differing opinions without succumbing to the cheap tricks of attributing disagreement to bad motives and to lack of intelligence among opponents. BTW, my very first professional paper in economics (first written in 1984, but published in 1989) was inspired by reading Galbraith and attempting to negotiate between Galbraith and the institutionalists on the one hand, and the Austrians on the other.